Is globalization an engine of economic development? This blog post draws on data and research discussed in our entries on International Trade, Extreme Poverty and Global Income Inequality. All people living in today&apos;s world have experienced some of the benefits of globalization: the expansion of foreign trade has meant that vaccines and antibiotics produced in a handful of countries have been widely used all over the world to eradicate diseases and treat deadly infections. Since 1900, life expectancy has increased in every country in the world, and global average life expectancy has more than doubled. Globalization has also been a key driver of unprecedented economic growth and as a result, we now live in a world with much less poverty. Yet these achievements are the product of multiple forces, and globalization is only one of them. The increasing potential of governments to collect revenues and redistribute resources through social transfers has been another important factor contributing to improved standards of living around the world. Neither free market capitalism nor social democracy alone has been responsible for economic development. On the contrary, they often work together. In this blog post, we discuss in more detail the evidence behind these claims. International trade has been part of the world economy for thousands of years. Despite this long history, the importance of foreign trade was modest until the beginning of the 19th century—the sum of worldwide exports and imports never exceeded 10% of global output before 1800. Then around 1820 things started to change quickly. Around that time, technological advances and political liberalism triggered what we know today as the &apos;first wave of globalization&apos;. The chart below shows the remarkable growth of foreign trade since 1800. The series shows the value of world exports in constant prices—world exports have been indexed, so that values are relative to the value of exports in the year 1913. The broad trend in this chart is striking: Trade followed an exponential path. Other metrics of trade, such as the share of imports and exports in global output, tell the same story. In just a few generations, globalization completely changed the world economy. In the period in which international trade expanded, the average world income increased substantially and the share of the population living in extreme poverty went down continuously. Regarding extreme poverty, the available evidence shows that up until 1800, the vast majority of people around the world lived in extreme deprivation, with only a tiny elite enjoying higher standards of living. In the 19th century we began making progress and the share of people living in extreme poverty started to slowly decline. This trend is shown in the chart below. As we can see, today, two hundred years later, the share of people living in extreme poverty2 is less than 10%. This is an achievement that would have been unthinkable to our ancestors. 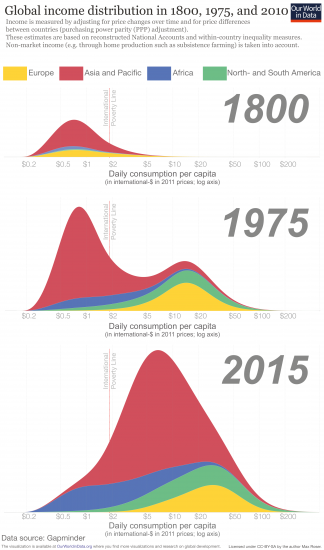 The stark trend in the incidence of poverty is particularly remarkable if we consider that the world population increased 7-fold over the same period. In a world without economic growth, such an increase in the population would have resulted in less and less consumption for everyone. And yet, as the chart shows if you switch to the &apos;absolute&apos; view, the exact opposite happened: in a time of unprecedented population growth, we managed to lift more and more people out of poverty. The fact that trade and average incomes followed similar upward trajectories in a period of unprecedented poverty reduction is of course not proof of a causal relationship. However, both evidence and theory suggest that what we observe is more than an accidental correlation. Trade facilitates efficiency gains that are materialized in aggregate economic growth. From a conceptual point of view, international trade contributes to economic growth by allowing nations to specialize, in order to produce goods that they are relatively efficient at producing, while importing other goods. There is substantial empirical evidence backing this causal mechanism. When taken together, the evidence thus tells us that globalization has contributed to reducing poverty around the world. That globalization is good for the poor is a statement that is true on average. In some countries and in some periods the poor did better than average, and sometimes they did worse. Looking at the long-run average effect is very helpful to form an opinion regarding broad trends. However, these broad trends are not necessarily informative about how trade has affected the distribution of incomes generally; nor about how trade has affected specific groups of people in specific periods. The same economic principles that suggest we should lend serious consideration to the efficiency gains from trade, suggest that we should do likewise for the distributional consequences from trade. If globalization generates growth by allowing countries to specialize in the production of goods that intensively use locally abundant resources, it is natural to expect that differences in the way resources are endowed will translate into differences in the way benefits are reaped. If we take a look at the data, we observe that the process of globalization and growth that led to historical achievements in poverty reductions went along with a substantial increase in global income inequality. The chart below shows this by comparing the global income distribution at three points in time: 1800, 1975, and 2015. We can see that the world today is both much richer and more unequal than it was in 1800. There are two forces that can drive global income inequality: within-country differences in incomes, and between-country differences in incomes. Which of the two is driving the trend we observe in this chart? The evidence suggests that it is the latter—global inequality increased in the period 1800-1975 because the countries that industrialized earlier grew faster. In 1800, only a few countries had achieved economic growth while the majority of the world still lived in poverty. In the following century, more and more countries achieved sustained economic growth, and the global income distribution became much more unequal: there was a clear divergence between early-industrialized countries (where extreme forms of poverty were virtually eradicated) and the rest of the world. In the following decades and up until today, early-industrialized countries have continued growing, but the biggest changes have taken place at the bottom of the distribution. Today, global income inequality is lower than it was in 1975. But still, despite the ‘catch-up growth’ in recent decades, our world today is both much richer and more unequal than it was in 1800. So, what does the data tell us about globalization? Over the last century, the gains from international trade were substantial and generally equally distributed within countries, but global inequality increased because for a long period early-industrialized countries had larger gains to distribute among their citizens. If this is the case, then why has the view that globalization is bad for the working class captured the political debate in rich countries? Part of the answer has to do with the fact that people are misinformed about the evidence. But another important reason is that, while globalization may not have been the prime cause of growing inequality within many rich countries, it remains true that there are specific groups of people who have not reaped many of the benefits from globalization in recent years. These effects on specific groups are real and need to be taken into account, even if they do not imply that ‘globalization is bad for the poor’. Public policies should protect and compensate workers whose earnings are adversely affected by globalization. And as a matter of fact, public policies in rich countries have done this to some degree in the past. As painful as job losses are for the affected workers, it is thanks to unemployment benefits and other safety-net policies that we do not observe unemployment leading to widespread extreme poverty in rich countries. Has globalization been an engine of economic development? The answer is yes. Globalization has had a positive effect on economic growth, contributing to rising living standards and the reduction of extreme poverty across the world. Can we conclude from this that we should strive for a ‘hyper-globalized’ world economy in which there is completely free trade with no room for public policy and regulation? The answer is no. The point is that the worldwide historical achievements that we can attribute to globalization are not independent of other factors, including the potential of governments to redistribute resources. Indeed, as the chart below shows, the process of globalization that we have experienced in the last couple of centuries took place at the same time as governments increased their potential for taxing and redirecting resources through public policies, particularly social transfers. How much integration in global markets would be optimal? I would be skeptical of anyone who offers a definitive answer. But it seems unlikely that the optimal degree of integration is either of the two extremes—neither ‘hyper-protectionism’ nor ‘hyper-globalization’ is likely to be the answer. Policies aimed at liberalizing trade, and policies aimed at providing social safety nets, are often advocated by different groups, and it is common for these groups to argue that they are in conflict. But both economic theory and the empirical evidence from the successful fight against extreme poverty suggests this is a mistake: globalization and social policy should be treated as complements rather than substitutes. The data in the chart below measures ‘extreme poverty’ as defined by the World Bank; people are considered to live in extreme poverty if they have to get by with less than 1.90 ‘international dollars’ per day. International dollars are a hypothetical currency that corrects incomes for differences in price levels in different countries as well as for inflation (explained by us here). Dollar, David, and Aart Kraay. "Growth is Good for the Poor." Journal of economic growth 7.3 (2002): 195-225. See, for example, Dollar and Kraay (2004), "Trade, growth, and poverty." The Economic Journal 114.493 (2004); and Dollar, Kleineberg and Kraay (2014), "Growth, inequality, and social welfare : cross-country evidence." Policy Research Working Paper. Helpman, Elhanan. Globalization and Wage Inequality. No. w22944. National Bureau of Economic Research, 2016. Trefler, Daniel. "The long and short of the Canada-US free trade agreement." The American Economic Review 94.4 (2004): 870-895. David, H., David Dorn, and Gordon H. Hanson. "The China syndrome: Local labor market effects of import competition in the United States." The American Economic Review 103.6 (2013): 2121-2168.